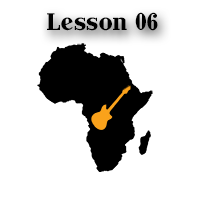 Did you know that polyphonic guitar existed in Africa? Well, you have probably assumed it before, and you were right. This of course shouldn’t hit you as a surprise. At least not if you knew that Africa was actually the cradle of polyphonic music (as understood by our current knowledge). First of all, there’s no reason to panic. While the example seems tricky (especially when you start trying to play it), it isn’t all that hard to manage. It will take some time, patience and the right kind of practice method, but you’ll succeed. Especially if you get the TAB for it. The piece has got a shuffle feel to it; the thumb plays the bass on the lower strings, and the rest of your fingers play the melody on top. As far as fingers go, it’s your choice which one(s) you go with for the melody. It can be done with any of the remaining ones; the two finger style is pretty traditional in Africa anyway. If you have noticed in the video, my thumb doesn’t seem to move much. It’s gonna make things easier for you in the long run, if you zero in on a kind of economic motion. That way you’ll be able to pick the bass notes and skip strings fairly quickly. Note that the bass notes are not overpowering the melody line. Putting the simpler bass figure in the spotlight would sound weird. Make sure you accentuate the melody. 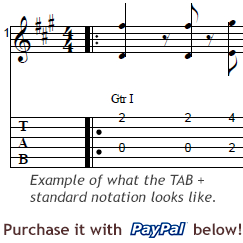 An interesting aspect of this kind of polyphonic playing is – even though they might look like it – there are no actual chord shapes fretted for the tune. It’s just bass and melody notes, and figuring out which finger is the most comfortable to fret them. The 2nd part gets pretty easy, with only the bass line moving, so don’t give up!